West Lancashire MP Rosie Cooper and the Alliance for Beverage Cartons & the Environment (ACE UK) launched a new recycling service for PE-lined paper cups in Burscough last week. 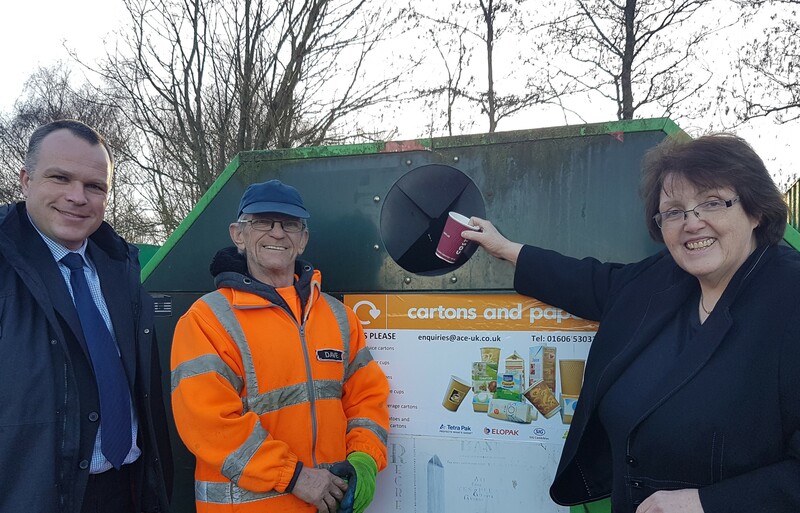 Since January 2018, West Lancashire residents have been able to recycle their used cups alongside food and drink cartons at specialist bring banks located at Burscough Household Waste Recycling Centre, Abbey Lane. The bring banks accept PE-lined paper cups which are used for hot drinks such as tea and coffee in high street coffee shops, fast food outlets and supermarkets, including Costa, Starbucks and McDonalds. The new service is the result of an agreement between ACE UK, which operates the dedicated food and drink carton recycling service available in Burscough, and high street retailers and cup manufacturers. The agreement was set up to give many more people access to recycling for paper cups through the carton bring bank service. Cups are made from similar materials to food and drink cartons and will be recycled using the same process, at ACE UK’s recycling facility in Halifax. “Previously coffee cups could not be recycled through council waste collections but with their growing use it was imperative to take the opportunity to include them. Joining MP Rosie on site for the launch were Huhtamaki’s Head of Corporate Responsibility Wouter van Tol and Cllr Ian McKay, who works at the centre. Huhtamaki are one of the members of the Paper Cup Alliance and funders of the recycling scheme.